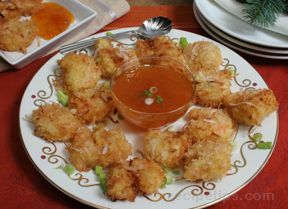 Now you can make this tasty restaurant specialty at home as a main dish or appetizer. Add the easy-to-make orange sauce for the perfect flavor accent. 1. Pour oil into deep fryer, large heavy skillet or saucepan, filling no more than 1/3 full. Heat on medium heat to 375° F.
2. Stir Batter Mix, ginger and water in medium bowl until mixed. (Batter will be slightly lumpy.) Place 1/2 of the coconut on large plate. 3. Dip shrimp, a few at a time, into batter. Shake off excess. Roll in coconut. Carefully add shrimp, several pieces at a time, to hot oil. Fry 3 minutes or until golden brown, turning once. Drain on paper towels. Repeat with remaining shrimp and batter. Add remaining coconut as needed. 4. Heat marmalade, orange juice and soy sauce until marmalade is melted. 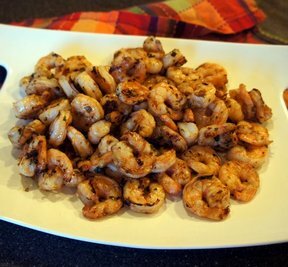 Serve with shrimp.